This flavorful, four ingredient Slow Cooker Lemon Chicken takes just five minutes to prepare. Perfect for the busiest of weeknights or when you simply don’t want to put forth a lot of effort to get dinner on the table. Keep in touch! Subscribe to receive Melanie Makes recipes direct to your inbox. Original content posted July 2013. Updated January 2019. 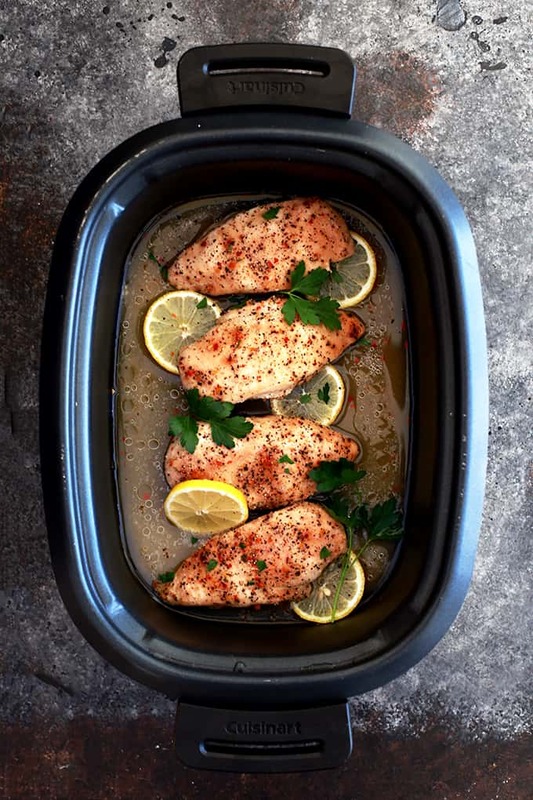 I dare you to find an easier or more flavorful dinner idea than this four ingredient Slow Cooker Lemon Chicken. And did I mention that everyone that sits at our dining room table gives it two thumbs up? They have no idea that it took just five minutes of work! It’s like the perfect storm in the world of recipes. Easy AND enjoyed by all? Who knew that was even possible? Perfect for the busiest of weeknights or when you simply don’t want to put forth a lot of effort to get dinner on the table. 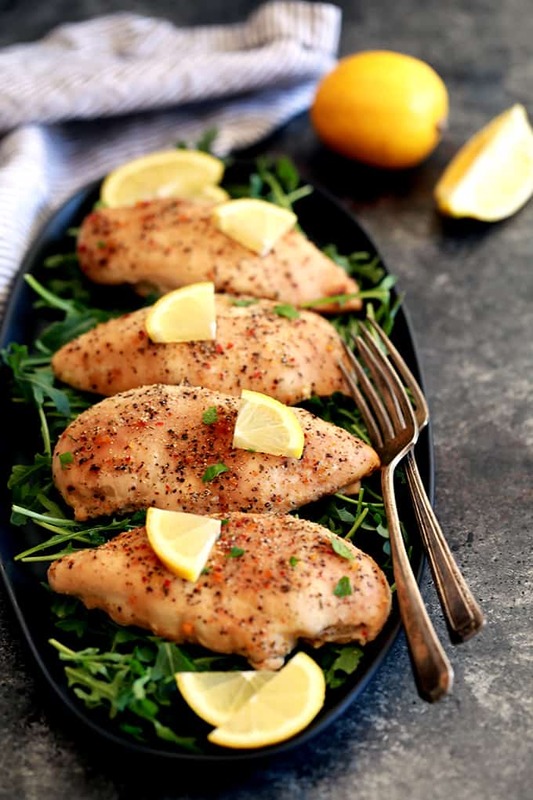 Lemon is always a great way to brighten the flavor of any dish and this Slow Cooker Lemon Chicken is definitely no exception. It’s also the key ingredient to my Lemon Arugula Pasta, Slow Cooker Lemon Rosemary Lentil Soup and Roasted Brussels Sprouts with Lemon and Greek Yogurt. A trip to the fridge for a couple of lemons, chicken and butter and then an envelope of Italian salad dressing mix – flavor shortcut! – and you’ve got dinner nearly made. If only all things in life were this easy! Obviously, as soon as your slow cooker timer beeps when cooking has finished, you’re ready for meal time! Or if you want to dress things up, I love adding slices of lemon and some chopped fresh parsley as well as some cracked black pepper. Totally unnecessary, but it’s always fun to play dress-up with your food! TIP: Do NOT add sliced lemons to your slow cooker insert prior to cooking as they will become insanely bitter and you won’t want to eat the end result. What Do You Eat Lemon Chicken With? I love to then serve it on a bed of arugula or on top of Israeli couscous, which is my children’s absolute favorite way to enjoy it. I’ll admit I also love how the couscous absorbs the cooking liquid and concentrates the flavor even more. 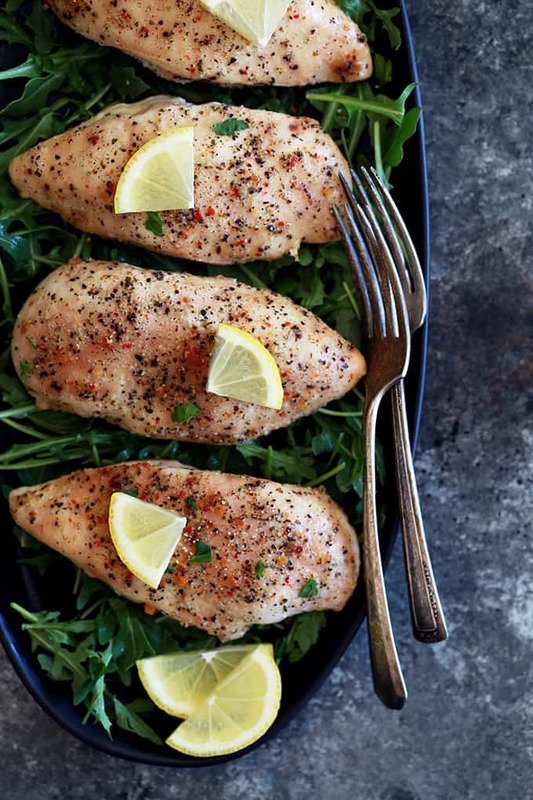 Not only is this Slow Cooker Lemon Chicken a great dinner idea, but it’s also a perfect meal prep solution as well. Having this delicious chicken on hand in your fridge for the week ahead is a great starting point for a quick salad, sandwich or wrap. 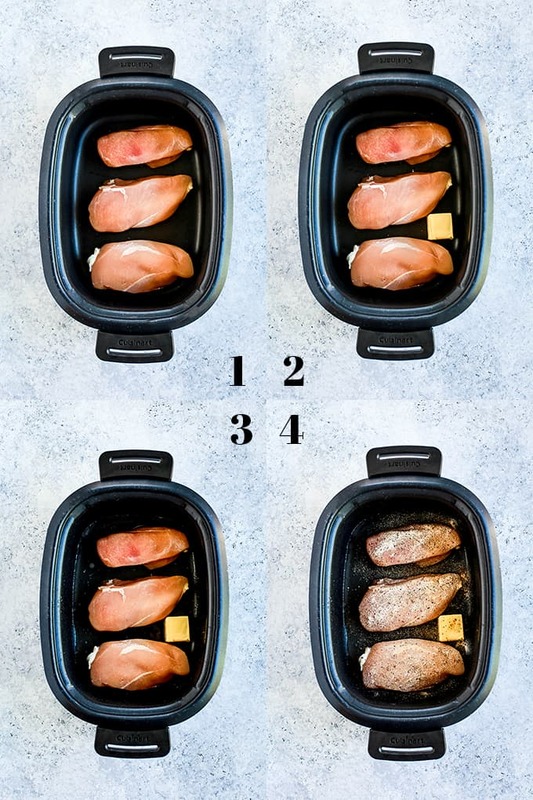 Add chicken breasts to slow cooker insert. TIP: I like to make this recipe in this slow cooker – it comes in 4, 6 or 8 quart options – or using the slow cooker function of my Instant Pot. If using your Instant Pot, you’ll want to use the tempered glass lid instead of the top that comes with it and is used for pressure cooking. Add butter to slow cooker insert. TIP: As the butter will obviously melt, there’s no need to cut it into pieces, just toss it in. Sprinkle Italian salad dressing mix over chicken. Cover and cook on LOW for four hours. TIP: You can purchase a single envelope of the Italian salad dressing mix although if you make this recipe frequently as I do, you’ll find it more budget friendly to purchase a box that includes multiple dressing mix envelopes. 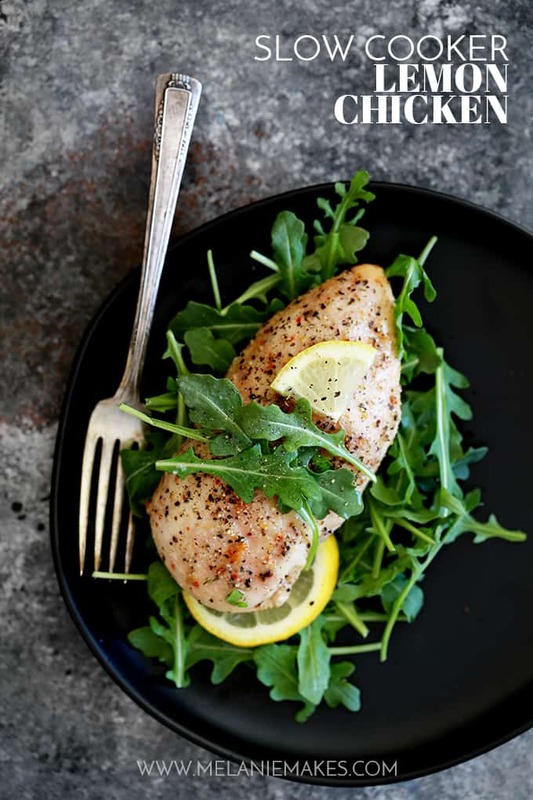 If you’ve tried this Slow Cooker Lemon Chicken or any other recipe on Melanie Makes, please let me know your thoughts in the comments below. I love hearing from you and respond to each and every comment! You can also follow me on Facebook, Twitter, Instagram and Pinterest for more delicious recipes. This flavorful, four ingredient Slow Cooker Lemon Chicken takes just five minutes to prepare. Perfect for the busiest of weeknights or when you simply don't want to put forth a lot of effort to get dinner on the table. Add chicken breasts to slow cooker insert in a single layer. Add butter to slow cooker. Sprinkle Italian salad dressing mix over chicken. Cook on LOW for four hours. TIP: I like to make this recipe in this slow cooker - it comes in 4, 6 or 8 quart options - or using the slow cooker function of my Instant Pot. If using your Instant Pot, you'll want to use the tempered glass lid instead of the top that comes with it and is used for pressure cooking. TIP: As the butter will obviously melt, there's no need to cut it into pieces, just toss it in. TIP: You can purchase a single envelope of the Italian salad dressing mix although if you make this recipe frequently as I do, you'll find it more budget friendly to purchase a box that includes multiple dressing mix envelopes. If one savory dish can be brightened with lemon, so can several others, right? You’ll want to take a look at this quick Pan Seared Lemon Thyme Wild Salmon, super easy 20 Minute Lemon Broccoli Pasta Skillet and Low-Carb Roasted Lemon Cabbage and Sausage Sheet Pan Meal. Can I cook on high for two hours instead of low for 4? Hi, Michelle - I haven't tried it that way so I can't say for certain! Delicious and so easy!! Thank you!! So glad you enjoyed it, Rachelle! Thanks for this great recipe! I’m wondering if you’ve ever added vegetables like broccoli into the pot to cook with the chicken? Wondering if that would work to have an entire meal ready sides and all! Thank you! 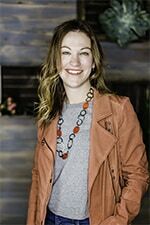 Hi, Jennifer - I've never added vegetables as I think they'd be quite soggy from sitting in the cooking liquid that's created while the chicken is cooking. If you don't mind the texture, you definitely could give it a try though! Recipe says serves 4. That's 8 oz per person. Isn't 5-6 oz per person a more usual serving size? Is there a substitute I can use for the salad dressing mix? I want to make this tomorrow for dinner, but I’m shopping at Trader Joe’s and I’m gonna guess they don’t have that ingredient ;) Thank you!! Hey, Shannon - I'm sure they won't! I don't have a substitute but if you're feeling creative, you could try making your own spice/herb mix instead! So glad that you enjoyed it, Roz! Thanks so much for taking the time to comment and let me know. So appreciate it! This couldn't look any more perfect! I have to put this on my menu! I hope you do, Abeer! I love chicken dishes. The addition of lemon makes it irresistible! This slow cooker dish is calling my name! I love the flavors you have! Looks delicious! Love using my slow cooker! It's my favorite kitchen appliance! this is in my slow cooker now… Looks and smells amazing. Can’t wait for dinner! Can't wait to hear what you think, Chrissie! This looks absolutely delicious! Yummy! Lemon flavors are my absolute favorite! This is such a simple recipe and I'll definitely be trying it soon! I cannot get enough of this meal. Especially on week nights !! It's a busy weeknight lifesaver! This was such a hit with everyone in our family! Definitely going into regular rotation. So glad to hear it, Sabrina! I saw where some people were asking about using frozen chicken in the slow cooker. I learned the hard way not to put frozen chicken in a slow cooker. I did some research and it is not recommended to put frozen meat in a slow cooker, as it holds it at a temperature as it begins to thaw for too long a time that allows bacteria to grow, and you can get sick. You might do want to re-check this, but that is what I found. Hi, D - You're right, although many people do put frozen chicken in their slow cooker - myself included - there are warnings against doing so. Wow, it really doesn't get any easier than this! Fantstic recipe! Thanks for catching that error, Zavier - you are correct! Is that half a packet of dressing mix? Hi, Gretchen - It's an entire packet of dressing mix - the ounce measurement is how much is in the envelope. Hope that helps! Hi Melanie,I made this last weekend and surprisingly the chicken came out a bit dry. I added all of the ingredients as you suggested (except I replaced butter with Earth Balance). Cooked on low for 4 hours. Do you have thoughts on what I might have done wrong? Do you think the Earth Balance is the problem? I was just trying to make it as healthy as possible! Hey, Eric - Interesting! I've never had dry chicken with this recipe and the majority of the time I don't even use the butter in the recipe so I don't think your substitute would cause the problem. Feel free to e-mail me and I can help you troubleshoot! I had the same problem with the dry chicken. I was wondering if I could cut down the time in the slow cooker a bit to prevent the dryness. Hi, Elodie - With the chicken sitting in cooking liquid and butter, I'm not sure how it has become dry? You could fiddle with the cooking time to see if that helps as your slow cooker might be running hot. Hope that helps! Hi Melanie, How much time does this need to cook if I would like to half the recipe? I currently have two 8-oz. chicken breasts on hand. This chicken is THE best chicken I have ever had! It was so yummy I was thinking of making it again the next day...this is a definite go to recipe! This recipe sounds awessome! Do you put the chicken in raw and defrosted? I'm a little new to crockpotting, haha. Hi, Kenzie - I've done both ways - both raw and frozen - you can't go wrong! Sounds amazing! If my slow cooker only has a HIGH setting for 4 hours, do I just use the LOW setting (8 hrs) and take it out early? Hi, Jordyn - I'm thinking that what you are saying would work. You definitely would only want to cook it for four hours on low, not eight. Hi Melanie,How much time does this need to cook if I would like to double the recipe? Hi, Mayra - It'll likely still be the same time as I typically double this recipe for our family of six in the hopes that we have leftovers! The same time has never failed me! How long would you leave frozen chicken in the slow cooker? Hey, Natasha - You could start with frozen and just cook it for about 5 hours and you should be good! Love a good healthy slow cooked chicken breast. This sounds moist, tender, and delicious! Looks like such an easy recipe! Perfect for a busy weeknight! My favorite for a busy night, Demeter! Such a delicious dinner option! We love lemon chicken! I'm betting you'd love these, Cathy! I have been working on doing more meal prep for the week. I can't wait to add this flavorful chicken to my rotation. Thinking of all the ways I can use this! You'll love how versatile it is, Dorothy! The slow cooker is my friend, and this looks like an amazing meal! I'm betting you'd love this easy recipe, Amanda! Love a good low carb slow cooker meal! I'm betting this would be a new favorite for you, Paula! 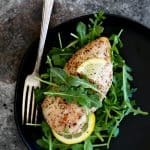 I'm a huge lemon fan so I love this idea for an easy low-carb dinner! Thanks for the shout-out for my Roasted Lemon Cabbage and Sausage Sheet Pan Meal! yum. i need to make this soon. i love lemon chicken and israeli couscous. That looks quite divine. On the list!